For millennia fish have been a vital source of human nutrition. Archaeological finds suggest that people have been catching fish since the Stone Age at least. For example, artefacts found in northern German river valleys include fishhooks made from bones and teeth as well as early spears with barbed hooks. But fish is more than just a food. In many cultures the fish is raised to near-mythical status. The Maori people call New Zealand’s North Island Te-Ika-a-Maui – “the fish of Maui”. According to legend the demigod Maui pulled a mighty fish out of the water, which then transformed into the island. 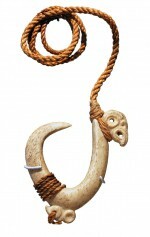 2.1 > A traditional fishhook from New Zealand. In the days of Alexander the Great, inhabitants of the Mediterranean town of Ascalon were such devout worshippers of the goddess Derketo, a mermaid-like being, that eating fish was taboo. The Christians even elevated the fish to a symbol of their faith community. They used the Greek word for fish, ichthys, as an acronym. It stands for Iesous Christós Theoú Hyiós Sõtér (Jesus Christ God’s Son Saviour). Today there is little remaining sign of mythical veneration. 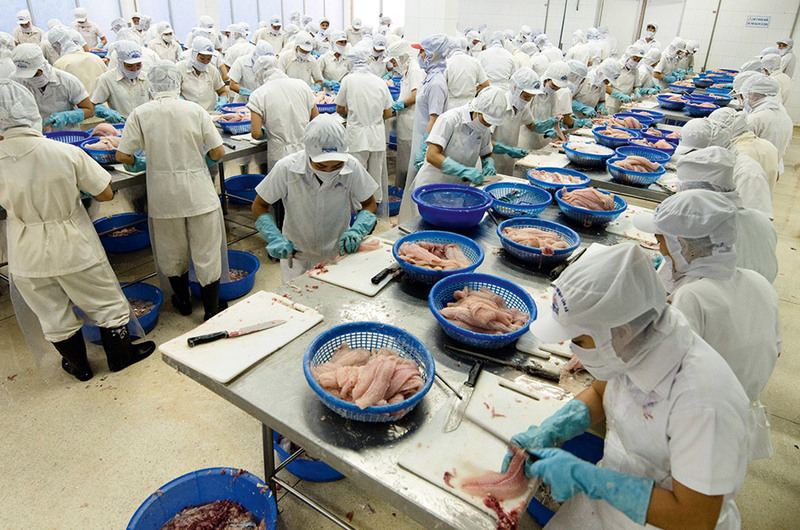 Fish is a foodstuff and a straightforward trade commodity. According to estimates by the Food and Agriculture Organization of the United Nations (FAO), today a total of 660 to 820 million people are directly or indirectly dependent on fishery. These include the families of fishermen and of their suppliers – the makers of fishing equipment, for instance. The FAO estimates the number of fishermen per se at around 54 million, of which 87 per cent live in Asia alone. Many of them work in small fisheries, and fish production per person is correspondingly low. On average it amounts to just about 1.5 tonnes. For comparison, the figure in Europe is around 25 tonnes per person. 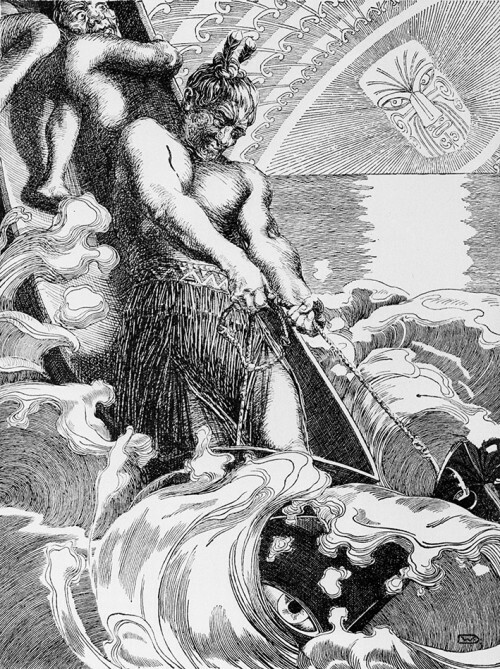 2.2 > The Maori demigod Maui catches a fish, which transforms into the North Island of New Zealand, Te-Ika-a-Maui. Small-scale coastal fishery: carried on with small motorboats which usually put out to sea for a day at a time. The home and landing ports are generally found in smaller coastal locations. Small-scale offshore fishery: makes use of vessels between 18 and 40 metres in size. The boats stay at sea for several days and land mainly fresh fish in large ports. Large-scale offshore fishery: ships are usually more than 40 metres long and do not necessarily stay within EU territorial waters. Catches are frozen immediately on board and sold throughout the world. 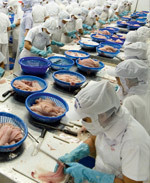 2.3 >Mass processing: Pangasius is filleted in Vietnam for export to Europe. Small-scale fishery: includes vessels under 14 metres in length without any superstructure (wheelhouse). In many cases these are wooden boats, which may be powered by sails or motors. Coastal fishery: covers unmotorized vessels between 14 and 26 metres in length as well as motorized vessels with a superstructure but under 26 metres long. Industrial fishery: includes all larger ships that do not fit into the first two categories. Mauritania has its own industrial fleet that exclusively catches octopus. It is mainly made up of trawlers of Chinese origin, which are old and in poor technical condition. 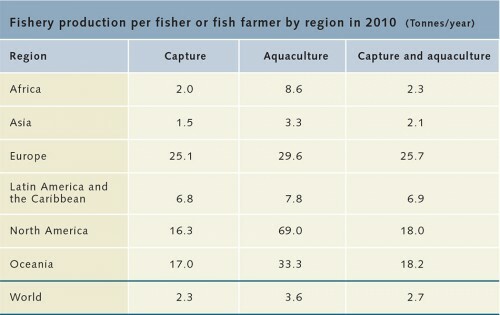 2.4 > The industrialization of fishery raises per-capita production. It is still low in Asia compared to Europe. Intensive feeding and feed optimization means that productivity in aquaculture is higher than in capture fisheries. The figures for North America are probably too high.